I’ve always wanted to read a newspaper like The Daily Prophet from Harry Potter, a daily with animated images and with articles that respond to the reader. 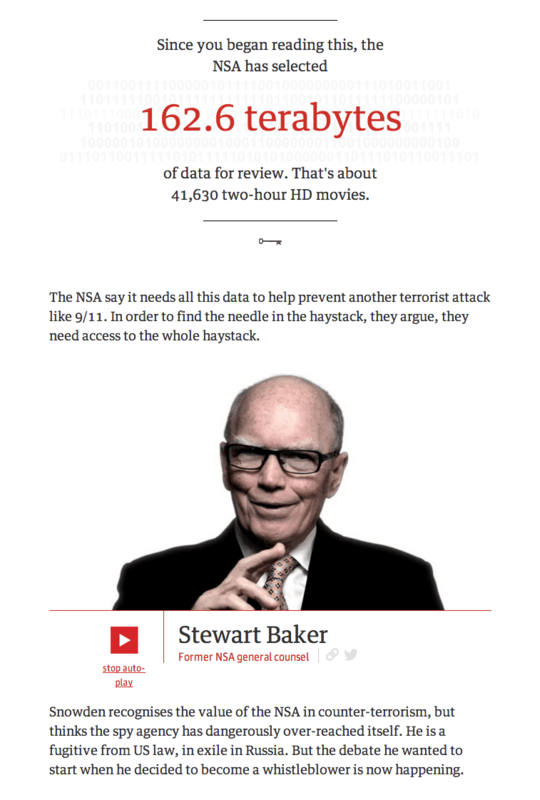 Last week, the Guardian, the world’s third-most widely read paper, published NSA Files: Decoded which explores the many different points of view on the NSA’s information collection efforts. As you scroll down, senators and attorneys and experts begin briefing you. Interactive data charts invite you to explore trends and embedded documents beg you to dig deeper. This is how a newspaper ought to be. This feature article represents the future of journalism and the written word, particularly in an era of touch-enabled devices. Today, crafting features like NSA:Decoded is a huge task and completely unscalable. The writers and editors and engineers at the Guardian likely invested tens if not hundreds of hours to assemble it. The content creation tools and workflows prevent widescale content production of this quality. I hope video creation and editing tools, content management tools, and the data visualization tools will evolve to such an extent that articles like NSA: Decoded are the norm. I see signs that this is starting to happen but it’s early yet. YouTube’s video creator ecosystem is pushing the boundaries of scalable video creation. Next generation enterprise content management systems must evolve, though I don’t know many new entrants in that sector. And the data visualization capabilities of D3, Google Fusion Tables, and Vega, among many others, need to be simplified and integrated into content creation workflows. I hope the team at the Guardian writes about the process they used to create their investigative journalism epic and that entrepreneurs take up the challenge to create the software to enable these rich, magical experiences to be published daily.